Whilst doing a purge of various photographs on my phone I came across the one below I took in March 2013. 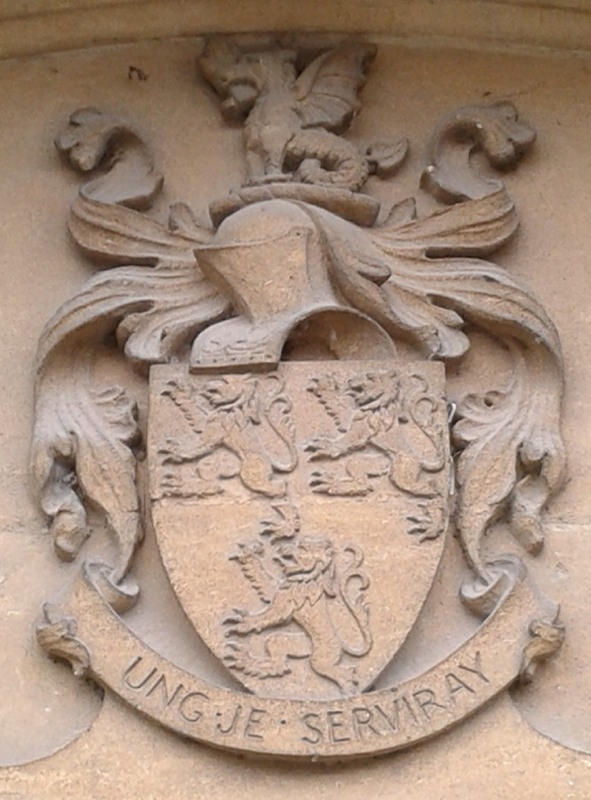 The Arms are displayed above the entrance to the Michael Herbert Hall in Wilton, Wiltshire. Arms: Per pale and Azure three lions rampant Argent. Crest: A wyvern wings elevated Vert holding in the mouth a sinister hand couped at the wrist Gules. The Hall, part of the Wilton House Estate, is described in its website as having been built “in 1932 to commemorate the younger brother of Sidney, 16th Earl of Pembroke“. I do not presume to tell the Earls of Pembroke their family history, but Burke’s Peerage does not show a younger brother of the 16th Earl called Michael. Sidney, the 14th Earl, did have a younger brother, Sir Michael Henry Herbert KCMG, CB, PC (b.1857 d.1903). Sir Michael had two sons, Sidney and Michael. The younger son, Michael George Herbert, died in 1932 unmarried aged 39.